21 year old Christian T., a hardworking, genuinely enthusiastic young man, dreams of a career in law enforcement. Christian has served two six-month terms with Heart of Oregon AmeriCorps in Bend, and is in the midst of serving a third. At Heart of Oregon Corps, he will earn almost $9,000 in AmeriCorps education awards, a type of college scholarship based on a term of national service. This college scholarship money coupled with intense structure, support, and encouragement from our staff has opened the post-secondary door for Christian. He is now enrolled in courses at Central Oregon Community College. 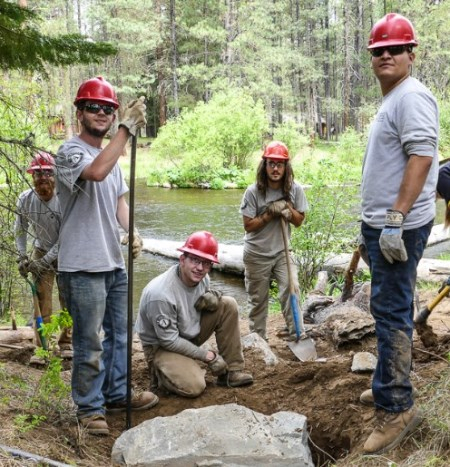 He manages his time between attending classes and serving on our AmeriCorps crew, which is currently involved in fire fuels reduction near Phil’s Trail, Tumalo, Eagle Crest, and northern Bend. Christian shares, “I was having a hard time finding a job after high school. I entered this program so I could find a new experience. I now can perform CPR, operate a chainsaw, and operate a forklift. I plan to pursue a career in law enforcement.” Christian isn’t alone; his fellow corpsmember Allen S. has long talked about his dreams of owning his own arcade, saying, “I entered the program for the education award, I plan to go to college for a business degree.” Spending half of the week learning job skills, and the other half attaining a post-secondary education, Christian is a fine example of our mission to inspire and empower positive change in the lives of young people through jobs, education, and stewardship. This month, the total amount of scholarships we've awarded to youth surpassed $1,000,000! That’s one MILLION dollars earned by 560 local young people since 2007, empowering them to pursue postsecondary options. In addition to using the award for traditional college degrees, vocational and training opportunities are also available and encouraged. Certifications in automotive, health care, truck driving, or cosmetology are in reach.